After metamorphosis, toadlets appear as miniature adults with the exception of having yellow spots. For arroyo toads, sand is de rigueur. Whether in a seasonal creek or during extended dry seasons, these toads endure harsh conditions by burrowing into sandy streamsides and sealing themselves within a thin shell of shed epidermis. Once found in large numbers from Monterey to San Diego and northern Baja California, arroyo toads have disappeared from as much as 65 percent of their historic range. Urban sprawl, dams, grazing, mining and off-road vehicles are devouring what little remains of arroyo toad habitat, while nonnative species devour the toads themselves. 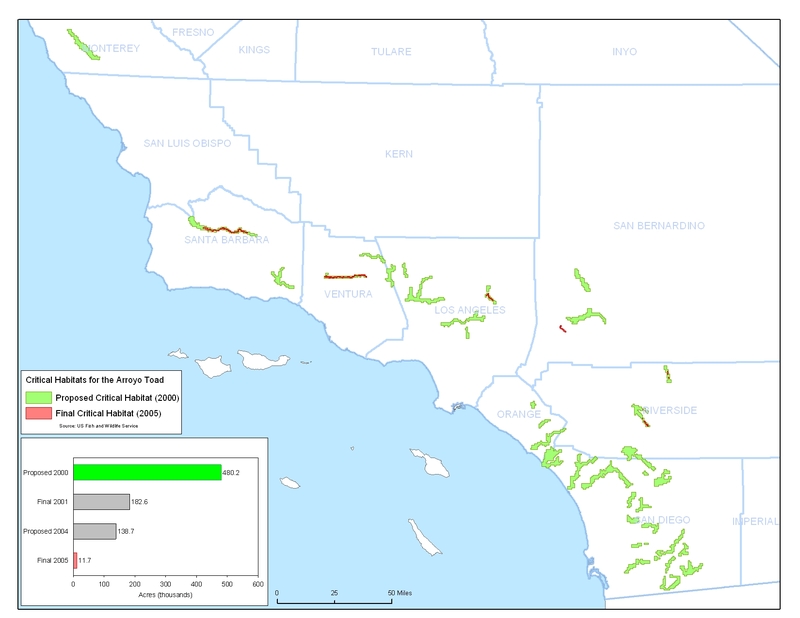 In 2000, the Center settled a suit with the U.S. Forest Service that included an agreement to close parts of Los Padres National Forest to protect arroyo toad habitat. In 2001, the Center won protection for the arroyo toad by convincing the Bureau of Land Management to close a sand-and-gravel mine in Whitewater Canyon, protecting one of the few remaining toad populations within the California Desert Conservation Area. And in 2005, we worked to maintain Angeles National Forest closures to off-road vehicles along Southern California's Littlerock and Santiago creeks. In August 2007, we filed a notice of intent to sue the Bush administration for its failure to adequately protect the toad and 54 other species, taking the administration to task for allowing a political appointee, Julie MacDonald, to dictate policy to scientists working on the 2005 decision that cut the toad's proposed critical habitat by more than 90 percent. Three months later, the U.S. Fish and Wildlife Service announced that it would reverse that critical habitat decision and reconsider protections for the toad and five other imperiled species affected by tainted determinations. In December 2007, we sued to ensure that the toad's new critical habitat designation is adequate and to challenge designations for 12 other species. In October 2009, the Service proposed more than 109,000 acres of critical habitat for the toad — but the next year, an agency report recommending downlisting California's rare arroyo toad from endangered to threatened, without demonstrating that toad populations have rebounded to an acceptable level. In 2011, thanks to our legal work, the Service finally increased the toad's critical habitat to 98,366 acres.